The Cherry Blossom’s have made an early display in the Pacific Northwest and it looks like the recent rains have already closed down the show pretty early. 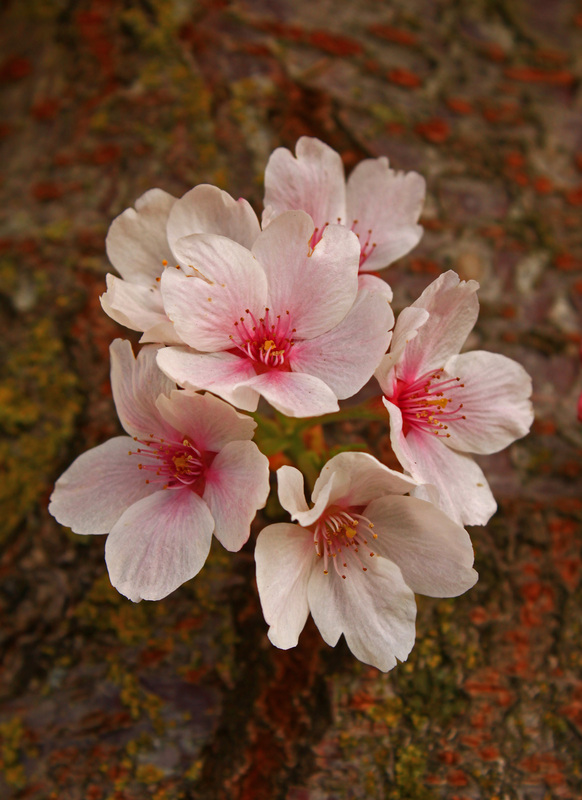 Even though Spring just started, most of the blossom’s had started blooming several weeks ago. You can still find a few trees that bloom later than most but you will have to wait for a few days before the sun reappears in order to try to photograph any of the trees that are still in bloom. I was really surprised to find almost no bees swarming around the trees throughout the Willamette Valley. I only found one bee hive and usually I find myself immersed and surrounded by hundreds of hungry bees swarming along the trees. Maybe it’s because they bloomed well before spring or maybe it’s a sign that the bees are having a harder time that we thought. Most of the spring vegetation is still dormant or just barely starting to show their colors, so I expect that once it starts to dry out again and warm up the bees will be out in force. I would recommend that you get ready for some pretty spectacular spring flowers to make a rather awesome entry by early next week. Even though there are a lot of tulip’s and lily’s making an early arrival, I think that we should have a pretty spectacular display of flowers over the next several weeks. Another awesome day along the Oregon coast last Saturday. It wasn’t quite as warm and sunny the last few weekends but as you can see, the weather was still amazing. However, the sunset was somewhat subdued due to a very large system that was hovering along the horizon, which caused for a less than dramatic sunset. I was still able to get some unique shots but I wasn’t able to recreate the nuclear type of explosion of color that I usually look for. I was fortunate enough, though, to take advantage of a very low tide that allowed me to walk nearly to the edge of Haystack rock. I have only experienced one other time that I was able to get that far out towards the Needles and Haystack rock and it was almost as though I was experiencing a summer night rather than a March night. Again, I was fortunate to find a lot less photographers with their tripods but I did encounter a lot of people walking near the edge of the low tide. It made it a little hard to get some of my shots but they cleared out pretty early and I was able to just re-position myself each time someone was in my line of shooting. 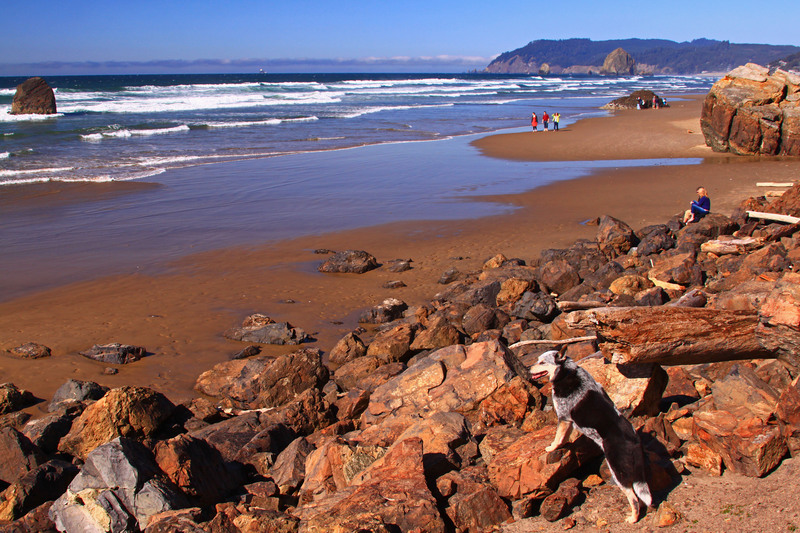 I took this particular shot north of Cannon Beach and as you can see my Australian Cattle Dog is in the picture. He was having a heck of a time running along the beach so I decided to add him to some of my shots. You will notice the cloud front way out along the horizon. They lingered out all day and into the night. I was hoping that they might burn off but unfortunately that wasn’t the case. This weekend is calling for rain and clouds but the weather is supposed to get better by next week and I’m sure that the coast will be getting some more great weather. 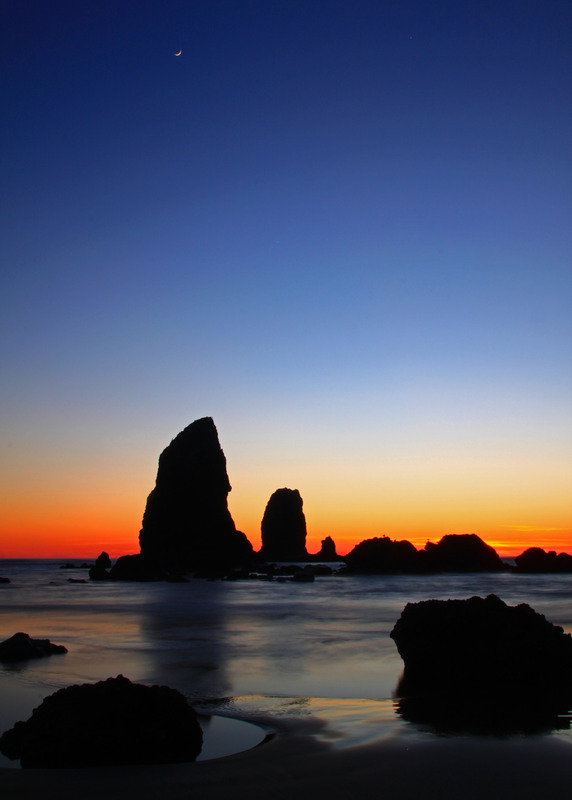 Moon over Cannon Beach, Oregon is one of the best photo opportunities that I can experience while shooting sunset shots in the Pacific Northwest. However, I haven’t had the pleasure of seeing a large moon but even if it’s as small as the one in this photo, I’ll take it any day. The weather is showing that the summer weather throughout the entire Pacific Northwest will hang around for another week or so and the Oregon coast will again be in the 60’s. I would recommend that you grab your camera, tripod and head out to the coast and hope for another epic sunset. I will be heading out again and I can only hope that my last journey to the coast can be half as good this time. This photo was taken just after sunset and you can see the nuclear colors along the horizon. The tide was very low so I was able to get several other rocks in the photo that normally would be under water. The seabirds were pretty active since that tide was so low and they were scavenging along the exposed rocks, which either hindered my long exposures or gave me the opportunity to get some action shots with moving wildlife. Late winter and early Spring can really create some great sunset shots and my last outing didn’t disappoint. To get this shot I made sure to attach my ND4 filter as well as my UV filter and warming filter. I also made sure to use a tripod, bubble level and remote switch. I set the shutter priority to 5 seconds and increased the ISO to 200. The crowds were pretty small so I was able to move around much easier than other times. I was also fortunate that there weren’t many people walking out near the tide so I didn’t have to worry too much about trying to avoid having someone walk in front of me.